If you’re pressed for time, go to 5:50 to get a good look at what the Koch Brother’s war on clean energy looks and sounds like. Kait Parker kills it in this examination of Big Fossil’s guerrilla war against renewable energy. More wars in the US and A => Idaho Stripped Climate Change From School Guidelines. Now, It’s a Battle. 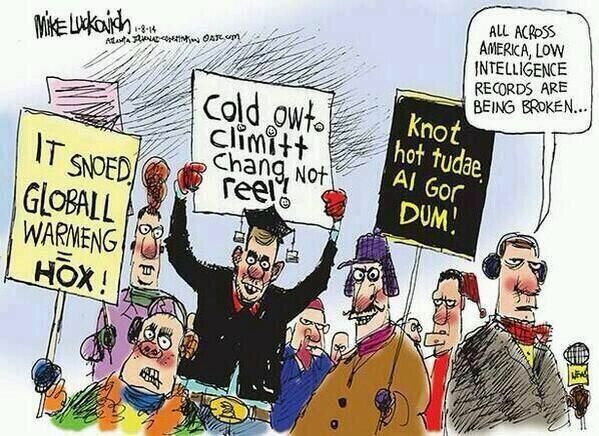 I love the cartoon, precisely because I know how much it burns deniers to be shown how stupid they are. I’m just not a nice person, I guess. How can you be ‘nice’ when you see all this crap? Here we are: After the 2016 solar boom, the industry lost 9,800 jobs between 2016 and 2017—the first drop ever recorded in the National Solar Jobs Census since it started collecting data in 2010. The Trump administration’s talk of solar tariffs and policy changes contributed to the drop, the report said. A closely analogous situation is happening for Wind&Solar. The world needs cheep and abundant energy…especially the poor. You don’t seem to understand your own reference. perhaps the most under-reported weather and climate change related story of the Winter of 2018 is the return of drought. Presently, more of the Continental U.S. is under drought conditions than not. And we are now experiencing, as a nation, the largest drought footprint in four years. Drought, which has left winter wheat struggling across the Great Plains, expanded to cover 38.4 percent of the contiguous U.S., the most since May 2014. Only 14 percent of Kansas wheat was rated in good or excellent condition at the end of the month, the lowest for that time since 2006, according to an earlier U.S. Department of Agriculture report. Meanwhile South Africa has its drought concerns with Cape Town could have it’s water cut off within a couple of months. How much fuel and pollution is saved by electric drone deliveries, especially where infrastructure is poor? It’s actually happening in parts of Africa that critical needs are being met.by drones.The advantages of drones with wings is that they are less prone to fail in bad weather and can travel further, and faster, which is perfect for the vast sparsely populated areas of Africa. Tanzania’s Medical Stores Department expects that all 5,640 public health facilities in the country will have all the essential medical supplies delivered by drone service, however remote their locations. The Developing world is just leapfrogging you US stuck in the mud dinosaurs. Lie manipulate deceive to your hearts content, the poor cannot afford the massive infrastructure costs and time to build that which you weirdly fantasise they can, maybe pay some politicians big graft and some tokens will happen. Electric short haul planes are in operation NOW, there are Arial EV taxi’s now, based on Drones – really cool . Just what will be needed and used in developing countries rather than spending huge Dollars building roads and bridges, maybe railways with EV Loco’s for the truly heavy loads.